About the new DTE DEALS! 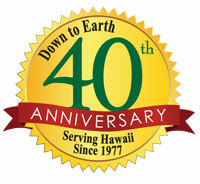 This year Down to Earth Celebrates its 40th Anniversary of service to Hawaii. So we wanted to do something special to show our deep appreciation of your continuing loyalty, and reward you even more for shopping with us. Not only will you receive greater rewards, you will also gain benefits that will help you have a better shopping experience with us. The new DTE DEALS! coupon program will give you access to coupons, Punch Card Rewards, digital copies of your Receipts, a Shopping List feature, and so much more! DTE DEALS! will be replacing the current Customer Rewards Points Program to offer you deeper discounts. Using the old points system, you had to spend $500 in order to get back a $5 Reward. With the new app, you could potentially save $5 or more in a single shop by using coupons you selected from the new app. The current Customer Rewards program will be discontinued over the next few months. May 31st, 2017 will be the last day for customers to earn points and July 31st, 2017 will be the last day to redeem your points. As always, you need to have a minimum of 500 points to redeem your $5 reward. You Will stop earning points for the current Rewards program. Begin redeeming points in $5 increments. Download the new DTE Deals! app and begin saving right away! After this date, you will not be able to redeem points from the current Rewards program. How Does DTE DEALS! Work? Now every time you shop at Down to Earth, you can save more money with new digital coupons that you can select from our new DTE DEALS! app. Just download the new DTE DEALS! app for iPhone or Android, set up an account (including selecting your dietary preferences) and that’s it! You’ll get coupons automatically loaded in the app that are only available on the app. Select the coupons of your choice and add them to your Shopping List. You can also enjoy free deli items by using Punch Card Rewards. At checkout, just show us your DTE DEALS! barcode and we’ll scan it, automatically applying your coupons to your purchase. How do I sign up for DTE DEALS! Coupon Program? Signing up is as simple as downloading the DTE DEALS! app from either the Google Play or Apple App Store. You can also sign up from the DTE DEALS! page. The program will ask you to enter your Loyalty ID. Since this is a new program, please select No and the app will generate a number for you. Once you’ve signed up, simply add coupons of your choice to your Shopping List. Sign up for DTE DEALS! Your coupons are stored in your Shopping List. Browse and select coupons at your convenience. When you set your dietary preferences, coupons matching them will be given preference and moved to the top of your list of Deals. View your Receipts digitally. You can use the search function to find items you’ve purchased. This can be helpful when trying to remember what brand of coconut water you bought last week or how much it was. Punch Card Rewards are earned by purchasing a particular product a certain number of times, to earn either free products or discounts. These rewards will range from smoothies, made-to-order sandwiches, organic espresso drinks and much more! What's so special about this new program? You can access the coupons at your leisure before coming to the store and add them to your shopping list. You can also manually add whatever else you need to your shopping list. The new DTE DEALS! program is used for coupons, viewing our sale items, making a shopping list and digital receipts. How do I redeem digital coupons in store? Once you are ready to checkout, simply tap on “Checkout” from within the mobile app, and your phone will present you with a personalized barcode. When prompted by the cashier, hold your phone up to the scanner which will beep after it successfully reads your barcode. All coupons that you have added to your Shopping List will be instantly applied to your purchase after scanning your barcode. Used coupons will disappear from your Shopping List. Coupons can be added again if they appear again on the list of Deals. As coupon offers expire or reach their limit will disappear from the list of Deals available to choose. If you are unable to download our mobile app, you can login to our DTE DEALS! page from any desktop computer and add your coupons to your "Shopping List" there. This will automatically apply the coupons to your purchase. To use your coupons, print out your Shopping List which will include your DTE DEALS barcode. Take this printout into your local store and the cashier will scan your barcode to instantly apply any coupons or rewards to your purchases. You only need to print out your barcode once but the barcode will always be available to print in the "Shopping List". Will the Customer Rewards Points System be available on the new DTE DEALS! program? Unfortunately we will be discontinuing our current Customer Rewards points system altogether. Customers who use the new DTE DEALS! program will not earn rewards. The new DTE DEALS! program is used only for coupons, viewing our sale items, making a shopping list and digital receipts. Why are you getting rid of the old program? Using the old points system, you had to spend $500 in order to get back a $5 Reward. That means you only get 1% back when you shop with us. 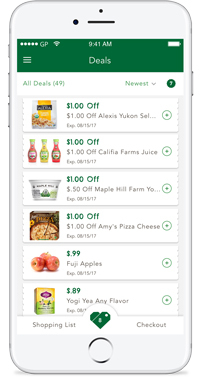 With the new app, you could potentially save $5 or more in a single shop by using coupons you selected from the new app. 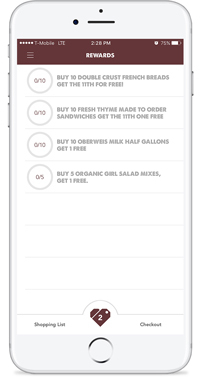 As more of our customers utilize their smartphones, as we've seen with our ever-increasing users of our existing Down to Earth Deli App, we have decided to offer this as a supplemental program to our normal sales. What kind of coupons are going to be available for the program? The coupons that'll be available on the app will be generated by brands, vendors and Down to Earth. These coupons are similar to those you find in newspapers, magazines, and other sources. There will be a diverse group of coupons that will offer a wide range of discounts. Are sales items only going to be available through the program? The program is only for certain coupons, not for Super Saver Deals or in-store specials. The sales items will remain available in the store. After I download the app or access the program online (available on June 1st), how will I be able to use the coupons I've selected? 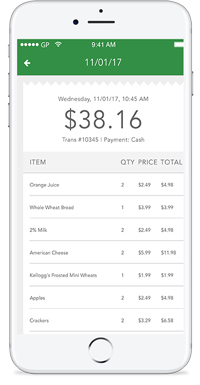 For app users: Once you are ready to checkout, simply tap on "Checkout" from within the mobile app, and your phone will present you with a personalized barcode. When prompted by the cashier, hold your phone up to the scanner which will beep after it successfully reads your barcode. All coupons that you have added to your "Shopping List" will be instantly applied to your purchase after scanning your barcode. Used coupons will disappear from your "Shopping List." Coupons can be added again if they appear again on the list of Deals. As coupon offers expire or reach their limit will disappear from the list of Deals available to choose. For non app users: Print out your "Shopping List" which will include your barcode. You'll take this printout into your local store and the cashier will scan your barcode to instantly apply any coupons or rewards to your purchases. All coupons that you have added to your "Shopping List" will be instantly applied to your purchase after scanning your barcode. Used coupons will disappear from your "Shopping List." Coupons can be added again if they appear again on the list of Deals. As coupon offers expire or reach their limit will disappear from the list of Deals available to choose. How often may I use the same coupon? This will depend on the Vendor that is providing the coupon. Upon use, the coupon will disappear from your wallet. If they’re available to be used again, they will appear on your list of Deals and you can add them again. I have additional questions about the program, who can I ask for help? If you are using our mobile app simply tap the “Support” link from within the main menu to contact our customer service. If you prefer to contact us online, use the “Contact Us” page on the Down to Earth website: www.downtoearth.org/contact. DTE DEALS! coupons may be used with other coupons and discounts. How to Use DTE DEALS!